Apostasy and blasphemy may seem to many like artifacts of history. But in dozens of countries around the world, laws against apostasy and blasphemy remain on the books and often are enforced. Last December, for instance, authorities in Sudan charged 25 men for apostasy – the act of abandoning one’s faith — including by converting to another religion. The men face the death penalty for following a different interpretation of Islam than the one sanctioned by the government. And, in Pakistan, police are currently pursuing a Christian accused of sending an allegedly blasphemous poem to a friend. Blasphemy – defined as speech or actions considered to be contemptuous of God or the divine – is a capital crime in Pakistan. A new Pew Research Center analysis finds that, as of 2014, about a quarter of the world’s countries and territories (26%) had anti-blasphemy laws or policies, and that more than one-in-ten (13%) nations had laws or policies penalizing apostasy. The legal punishments for such transgressions vary from fines to death. We counted and categorized these laws in 2014 as part of our research for a major report on restrictions on religion around the world. This report, which examines both government restrictions on religion and social hostilities involving religion, relied on 17 widely cited, publicly available sources from groups such as the U.S. State Department, the United Nations, Human Rights Watch, Amnesty International and the International Crisis Group. Some blasphemy laws have been on the books for decades and have endured in spite of dramatic political and social changes. In Pakistan, for instance, blasphemy statutes have their origins in the country’s colonial past, when British rulers first introduced penalties for insulting any religious beliefs. These laws remained in effect after Pakistan’s independence in 1947 and have since increased in severity. 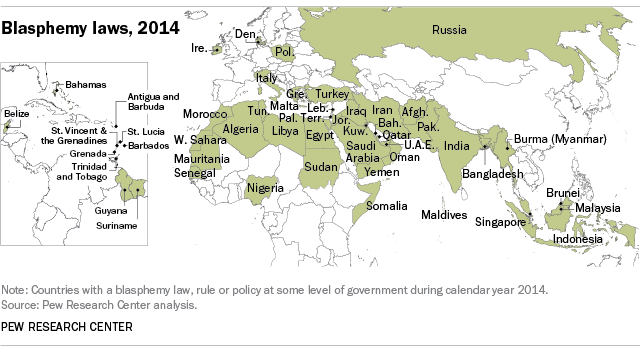 Pakistan is one of 12 of the 50 countries in the Asia-Pacific region (24%) that had blasphemy laws in 2014. And, during that year, blasphemy laws were enforced in several of those 12 nations. For instance, in Burma (Myanmar), a New Zealander and two Burmese men were convicted of blasphemy after using an advertisement depicting Buddha with headphones to promote a bar. The men were sentenced to two and a half years in prison. Blasphemy laws are least common in sub-Saharan Africa (four of 48 countries), according to 2014 data. In Europe as well, blasphemy laws are not very common, being found in just seven out of 45 nations (16%). In the Americas, 10 out of 35 countries (29%) had blasphemy laws, including the Bahamas, where the publication or sale of blasphemous material can be punished with up to two years imprisonment. The U.S. does not have any federal blasphemy laws, but as of 2014, several U.S. states – including Massachusetts and Michigan – still had anti-blasphemy laws on the books. However, the speech and religion clauses of the First Amendment to the U.S. Constitution would almost certainly prompt a court to ban the enforcement of any such law. Apostasy laws are less common worldwide – they are found in 25 countries, in only three regions of the world. By far the most countries with anti-apostasy measures were in the Middle East-North Africa region (14 out of 20). Seven of the 50 countries (14%) in the Asia-Pacific region also had apostasy laws. For instance, in the Maldives, all citizens are required to be Muslim, and those who convert to another faith may lose their citizenship. In sub-Saharan Africa, just four of the 48 countries (8%) have laws prohibiting apostasy. There were no laws against apostasy in any countries in Europe or the Americas in 2014. Note: This is an updated version of a post originally published on May 28, 2014.